Where are Asia's economies heading? You know that a stock market story has crossed into the mainstream once internet memes about it begin. Hash tags like "Greatfallofchina" started to fill my Twitter feed, and as each day brought more falls on the mainland Chinese stock markets (both the Shanghai Composite and Shenzhen CSI 300 saw major falls), each day also brought more panic for investors. Research houses put out daily reports trying to make sense of the fear and anxiety amongst investors as billions of dollars evaporated in front of their eyes. But where do Asian economies stand in all of this? And was all the fear and anxiety overblown and misplaced? After all, as one economist told me, "sometimes markets move so much faster than economists can update their data". There's no denying that Asian investors were rightly concerned by the stock market falls and recent yuan devaluation in China - there was a knock-on effect on commodity prices and some Asian currencies touched multi-year lows. 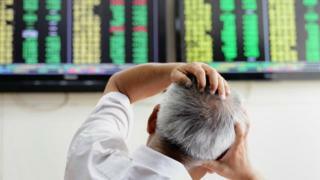 Adding to concerns was what appeared to be incompetence on the part of the Chinese government after they failed to halt the market slide despite pumping in an estimated $200bn. Even the International Monetary Fund (IMF) came out and acknowledged that global growth would be affected by what happens in China - because it makes up such a large part of the global economy. And then there are low commodity and oil prices - a boon for Asian countries like India which import raw materials and oil, but not so great for countries like Malaysia which is a net exporter of oil. So what that does all of that mean for Asian growth? Well, many economists feel that Asia will ride it out. To find out why, we need to cast our eyes back to 2008 and the last financial crisis. According to Standard & Poor's (S&P), Asia's economic growth before the crisis was 5.5% - a fifth of which was driven by external demand from the US and Europe. During the global financial crisis of 2008, S&P says global trade collapsed and has never fully recovered. But all of this happened against a backdrop of increased growth rates for Asian countries such as India and Indonesia. Even China - although no longer at double digit growth - still posted a respectable 7% during this period. Well, one theory is that countries in Asia were buying and selling a lot more from each other than they were elsewhere. So regional trade between the ASEAN region and China grew at a steady clip over the last few years, buffering them from the slowdown in the US and Europe. Asian economies have piggy-backed on the success of China's two-decade long economic boom. Selling to China helped the fortunes of businesses in Jakarta, Hanoi and Singapore. Then there's also domestic demand - something that China is trying to transition its economy towards and which now accounts for 45% of China's gross domestic product (GDP). Increasingly, economists are seeing the trend of a domestic demand-led story in some of Asia's most populous economies such as Indonesia and India. But what policy makers didn't do during the good times was fix some inherent structural problems in their own countries. Investment in infrastructure, for example, didn't keep up with the pace of growth, and red tape and corruption were also left unaddressed. Some economists believe that China's stock market volatility and the subsequent panic across global (not just Asia) markets was not necessarily grounded in economic fundamentals but driven more by investor sentiment. However, there are some very real concerns that Asian countries need to address as China's economy slows. There are bright spots for Asia - namely the improving US economy. America looks like it's getting stronger, and crucially the labour market is recovering. It is the biggest trading partner for most of Asia - so when US consumer demand recovers, so does Asian trade. But that could be scuppered by a potential increase in interest rates this month by the Federal Reserve. And China's economic health remains a question mark at the moment. But economists say China needs to slow down as it changes and rebalances its economy - and the government needs to manage growth expectations to keep this transition orderly. It is the "new normal" that China and the world needs to get used to. As the proverb says, a high tide lifts all boats. So when China and America's economies were doing well, Asia's was too. But when the tide goes out, those left standing better be ready to start picking up the pieces. For more on China's economic outlook, tune in to a special edition of Talking Business at the World Economic Forum in Dalian, China on 11 September. What next for the global economy after China market woes?